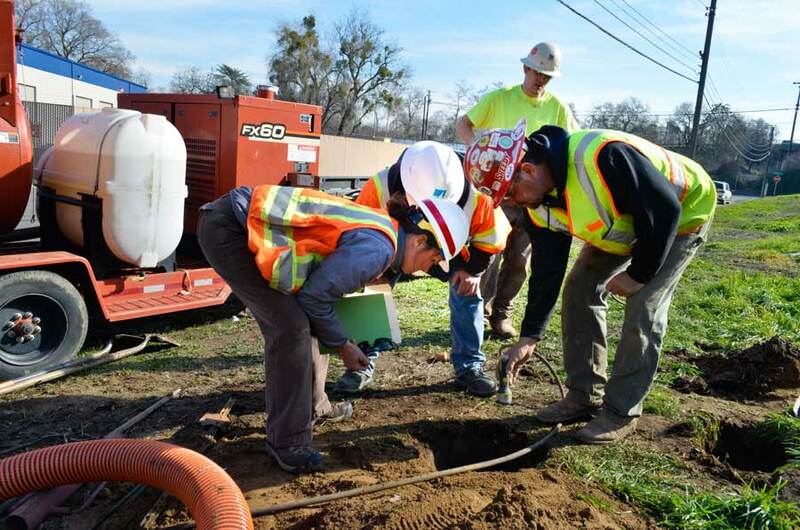 Construction contractors can use potholing to safely control potential problems while searching for underground utility main lines, such as for natural gas or cable television, without causing a severe inconvenience in the local area. The loose soil from the test hole can be quickly and easily removed with vacuum excavation to then provide an open space for construction workers to use to inspect for underground utility main lines. With practical techniques for reducing the number of potential problems, a construction contractor can control the costs and can focus on the construction schedule. The location of some underground utility main lines may not be documented because those lines for fiber optics or for wastewater may not have been used by the current owner of a building that had been demolished for a new project such as for new art and entertainment center. The contractor can use potholing in construction projects to prevent problems and to protect the workers who could possibly be injured by an underground hazard. The process for being offered a construction project does usually include bids from several contractors who must submit a construction plan and a budget for the project. Some of those contractors could encounter budget problems, such as for additional labor, equipment and supplies expenses, while being forced to replace an underground utility line that had been accidentally damaged while trying to build an underground garage for a new apartment building. Managers can use potholing in construction projects to protect investments and to become more prepared for accurately planning a new project. Some heavy construction equipment could potentially be unsafe in an isolated area where a hidden water well or a concealed sinkhole had not been filled with soil to control the problem. With vacuum excavation, a contractor can use equipment that will cause fewer safety problems and that can be used to easily remove soil without blocking a path with a pile of soil while digging to search for underground utility lines. The aesthetic advantage of underground utility lines is a problem for contractors who want to quickly locate those underground utility lines. The techniques for utility potholing can be used to minimize the degree of damage to the top soil at a construction site. With more detailed information about underground utility lines, a contractor can move forward with a project while also protecting the environment and not endangering a worker. The various factors for improving the quality of a construction project can be controlled with different methods such as with more safety equipment and with innovative techniques. A contractor can use utility potholing to reduce the worker turnover rate with safer working conditions and to ensure that the project will be a success. Project managers can conveniently contact Util-Locate for professional advice about the potholing services for a construction site.